Select the add (+) button to add assets. Add multiple assets at once using the Shift key. 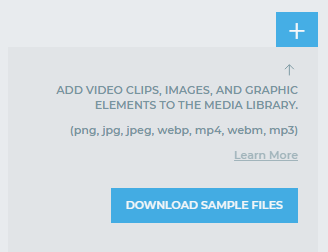 Adding files to the Media Library makes them available immediately, which means you can add assets on the fly during your broadcast. 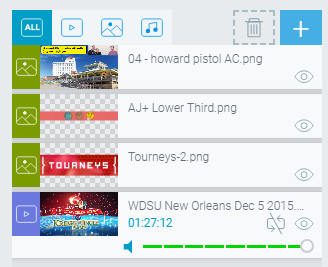 You can add videos, images, mp3s, and overlays. Videos must be mp4, 30 FPS, and maximum 720p resolution. Further specs here. Images must be RGB JPG or PNG; Images should be in a 16:9 aspect ratio to prevent stretching. Max suggested size: 1280 x 720. Assets (Videos, Images), like feeds, can be dragged to the Scene Builder to create new scenes. Overlays can be dragged to the overlay bar to add on top of your scenes - see here. MP3s can be dragged to the Audio-only bar to add music to your broadcasts. Assets can be previewed using the 'eye' symbol before they're taken live. Assets can be filtered using the icons at the top of the library to quickly find what you're looking for. Videos have an optional 'looping' icon that allow you to control whether the video will loop back to the beginning once the end of the video is reached.